I live by my calendar. I seriously would not know where in the world I am supposed to be without it. As I've mentioned before my memory is not the best so it is essential to have an organized calendar at all times. I rely on a digital calendar for a few reasons: 1. I can access it anytime, anywhere and it syncs between my devices 2. It is one less thing to carry around (although I write my assignments down on a small pad, I don't carry an agenda) 3. It is easy to change and it still is clean. When I was using paper I hated erasing and crossing out. 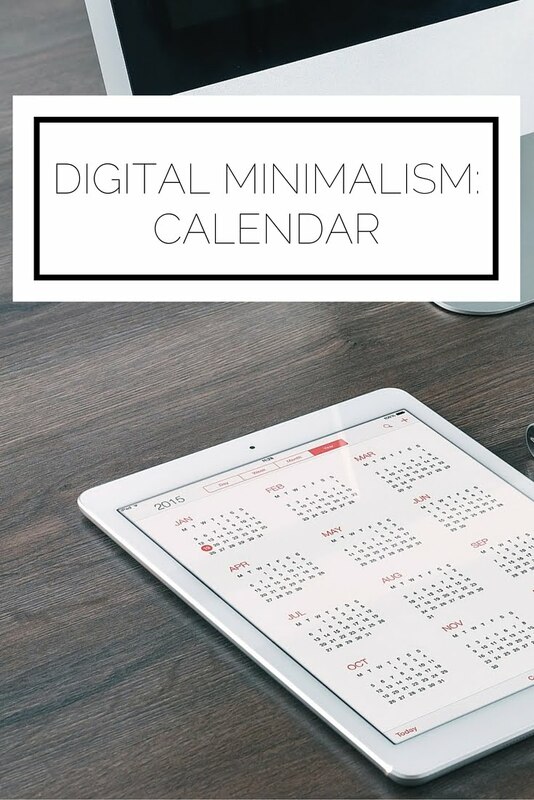 From a minimalist perspective (check out more minimalist posts in the digital series here), I wanted to share how I keep my appointments organized and create ease of use so you don't feel overwhelmed. With school starting up now is the perfect time to get yourself in order! First we're going to discuss how to determine what you're dedicating your time to, see if we can cut anything out (this is where minimalism really comes in to play and I find this to be the hardest part), and then we'll get down to actually getting your calendar up and running! Let's figure out the "categories" of your life. I have both broad and specific areas that I identify in my head which carries over to my calendar. When I first started out I had sooooo many separate categories including my many clubs, projects, classes, etc. which I figured out by simply sitting down and writing out a list of all of my commitments and meetings. I really recommend laying it all out over the course of a few days to get the best idea of what you are actually doing each week. 1. Are you passionate about this activity? 2. Would you gladly give up free time to do it? 3. How does it contribute to your main goal? 4. Does it energize you? When you ask yourself these questions you will start to realize that narrowing your focus is going to contribute to you living a happier and more purposeful life. Getting your priorities in order can do wonders for you mentally and can allow you to do your best work. Let's put it to paper (umm, to keyboard I suppose). Now we can get to creating the perfect digital calendar which is nothing but helpful, no one is going to feel overwhelmed around here, and which makes you excited to get up each day and get started. I use iCalendar and am absolutely a fan, but it really comes down to which devices you use and what's easier for you. 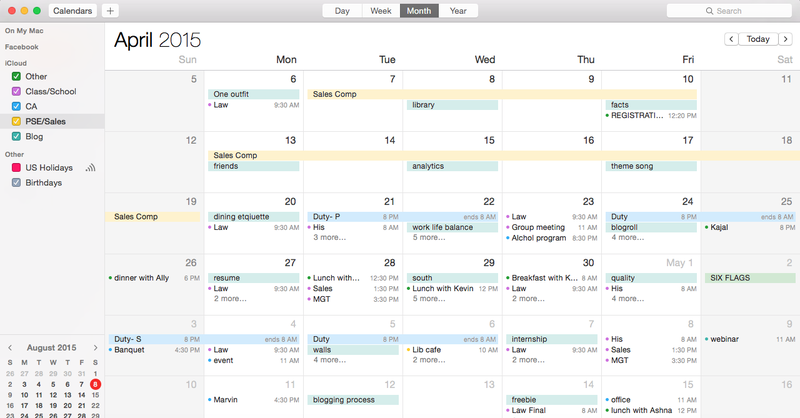 What really matters is the you can create multiple calendars and, at least for me, that you can color code them. My categories are: Other, Class/School, CA (which is my job, it's commonly called an RA at other schools), PSE/Sales (my business organization and the sales competitions I go to), and Blog. "Other" encompasses lunch dates, non-school meetings, etc. "Class/School" is just what you'd imagine. I like to always have my class schedule on hand and know when important assignments are due or when exams are. "CA" has all of my duty nights and programs while "PSE/Sales" has meetings, practices, and the like. Finally, I use my "Blog" calendar to map out my editorial content. As a side note, I get the best experience using my calendar when I put in as much information as I can. This includes the address, alerts or reminders before the event, and any other relevant information. Having it all in one place, as opposed to having information everywhere, just makes life easier. As you can see there is quite a bit going on, but when you look at a week or even one day at a time you will see that this is a great way to keep yourself on track and organized. By keeping a digital calendar you reduce your physical possessions, take away the worry of having to remember your schedule, and are better able to plan out your days. How do you keep yourself on track? Do you take a minimalist approach? Read more about digital minimalism here!